The modern man has been granted certain luxuries that allow for time and energy to be used for more than just work. How that time is used though, matters. How much time do you spend doing healthy activities? There’s more to looking like a gentleman than sporting the latest fashion. Looking good means feeling good about yourself, and that means being healthy. Yes, we’re talking about exercise. We all know that lifting weights is a crucial element of any workout, but so is cardio. 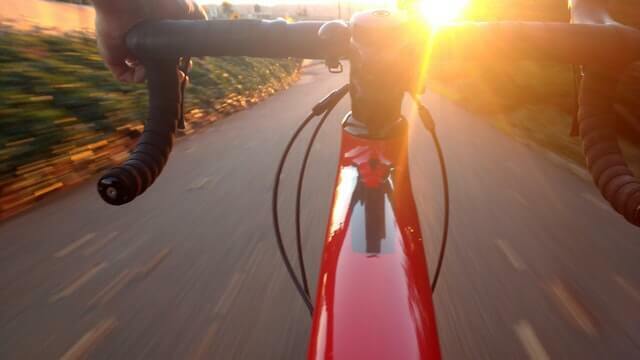 Biking is an extremely positive activity for both the heart and vascular system, and the real deal is much more fun than pedaling away on a stationary bike watching a video – no matter how good the video might be. A common misconception is that lifting weights and spending long hours at the gym is the best way to sculpt a body to its peak optimal shape. While this is true when the focus is muscle development, lifting alone does not address the needs of caring for the heart and maintaining vascular health. Cycling, whether at the gym, the park, or in a mountainous path along the forest, is an excellent form of cardio that can help keep a healthy and strong heart while also burning considerable calories. After all, the heart itself is a muscle and it needs its own dedicated workout focused on maintaining its strength. In addition to resistance exercises such as lifting weights at the gym, the cardio that is done via biking on rough outdoor terrain provides the benefit of toning a man’s muscles. Arms, legs, chest, and backside all look better after adding cardio to weight-lifting workouts. The reason for this is because muscles that are worked during lifts will burn more fat cells within them when they are used repeatedly over longer periods of time, as happens with cardio workouts like biking. As these muscles get their additional exercise, they give off the appearance of a more toned and lean look while retaining the strength and vigor gained with weight lifting. Let’s be honest, muscles that can lift look better with less layers of fat covering them. These layers are more quickly burned off when adding cardio such as biking into the daily exercise routine. Being able to bike in the outdoors for an extended amount of time proves that a man goes the distance with his body. The benefits to stamina development have wider applications than just being able to lift more or running longer. Increased stamina also has the benefit of a man being able to perform better in bed, which itself is a positive factor that all men strive to obtain. On the topic of being able to lift more, doing cardio such as biking helps the body push itself, so it can continue its repetitive motions for longer amounts of time. As this is done, the heart beats faster and harder which benefits its muscle cells, while at the same time pumping more blood throughout the body. As more oxygen is taken in, and more blood is pumped faster throughout the circulatory system, nearly every part of the body has greater access to cleaner and fully oxygenated blood that benefits nearly every tissue of every organ in the body. In addition to all the physical and health benefits of cycling, the fact that it looks better to be in cycling gear is another positive that isn’t overlooked by others, especially women. The body form-fitting material of cycling clothing along with the helmet, joint pads, and sneakers all just make a man look better as it gives the appearance of a person who takes his body and health seriously. With this appearance on a summer or spring day, this cycling clothing accentuates a man’s physique that is only bound to get better every day. As the weather gets friendlier, cycling ought to be at the top of any workout routine. It pays off in more ways than just better health and has the added benefit of making a man look physically attractive among a crowd of people. Even when a man is wearing a suit and tie, it’s easy to spot the difference between a man who only lifts and the one who also enjoys a sunny day on his mountain bike.